Mutual funds can be bought in two ways. One is through distributors and another is directly from Asset Management Companies (AMCs) or Mutual Fund houses. Since the beginning of the mutual fund it can be bought through distributors only. The direct plans of the funds were launched in January 2013. The direct plans were launched for the DIY (Do it yourself) investors. You will get to know the difference between Regular and direct plan, how to convert regular mutual fund to direct plan and what are the important points to remember before conversion from this article. What is Direct and Regular Mutual Fund? When you purchase a mutual fund unit from the AMC or fund house directly it can be called as direct plan of the mutual fund. The purchasing process is not routed through the AMFI Registration number (ARN) holder i.e. mutual fund distributor. When you purchase a mutual fund through ARN holder (distributor) it is a regular fund. The ARN Holder or distributor or broker gets the commission from mutual fund houses. Remember, while filling up the mutual fund form write the ARN code as ‘Direct’ to ensure the investment in a direct mutual fund. As there is no commission paid to the broker in case of a direct fund its expense ratio is slightly lesser than the regular fund. The direct fund is able to invest more amount of money than regular fund. As a result of it, the return from the direct fund is more than the regular fund. When this small part of return (difference of return between direct and regular fund) is accumulated over the years for a longer period of time the amount is not so bad. One example will clear your all doubts. If you invest in franklin India smaller companies fund in regular mode, the expense ratio is 2.4% and return for last 3 year is 20.4%. I am taking one year return and projecting it to 20 years to see the difference. 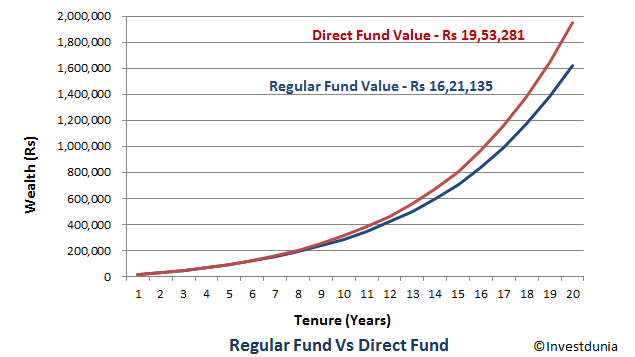 For direct fund one year return is 18.11% and for regular fund return is 16.62%. You will get Rs 19, 53,000 if you invest in direct fund whereas you will get only Rs 16,21,000 if youinvest in regular fund. There is a clear difference of Rs 3,32,000. How to Invest in a Direct Plan? There are various ways by which you can invest in a direct plan or regular plan of mutual fund. If brokers or distributors are present in between customer and fund house it is a regular fund. I would like to give you some examples of mode of investing where brokers are present. If you are a beginner and approach to an individual mutual fund agent who helps you to start an SIP, you are investing in a regular plan. The person or agent is the distributor of the fund and gets the commission. Investing through trading accounts such as ICICI Direct, SBI Caps, Axis Direct, and Fundsindia, Scripbox etc. is the investing in a regular fund. Here the brokers are those companies whose trading account you have. If you approach a nearest branch of SBI to open a mutual fund SIP you are investing in a regular fund. Here, SBI is the distributor of SBI Mutual fund and get the commission. In the other way, if you invest directly through the AMC website there is no broker present between you (customer) and fund house and you are investing in a direct fund. Many fund houses has come up with a common platform i.e. MF Utility where from you can buy direct funds. Recently, there are numbers of start-ups coming up which are offering the direct funds via their portal. Some of the websites are Zerodha Coin, Kuvera, Oro Wealth etc. These websites charge you in various ways. Check the pricing before investing through these websites. Do you want to invest in a direct mutual fund online? 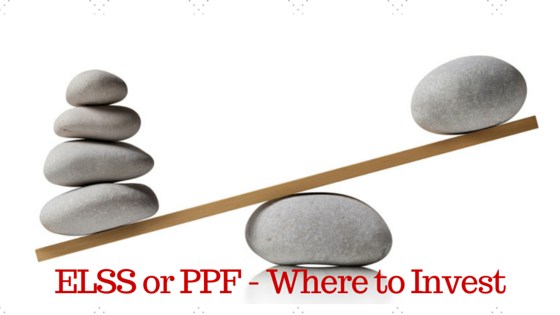 Read my article where I have explained the simplest way of investing in direct fund online. Now you are well aware of the difference in return between direct fund and regular fund. Are you thinking of switching your existing fund to direct fund? You can go to any AMC office and fill up a simple form requesting the switching of existing regular fund to direct fund. You can go to CAMS, KARVY office to switch the fund to direct. If you are well versed with online facilities, you can log in to AMC website with your fund details and change the regular to direct fund. Also the CAMS, KARVY website have the options of switching the fund. If you have MF Utility account you can switch the existing regular fund to direct fund. Don’t go to your bank, broker or trading account service provider to switch the fund because they are the distributor or agent and you cannot switch the regular funds to direct funds by approaching them. You can also sell or redeem the regular fund and invest the same amount in a direct fund. Remember that when you are switching the fund the regular fund is redeemed and it is invested in direct fund. So there will be applicable exit load (redeemed within one year of investment) for redeeming the fund. In the same ways what are mentioned in the above you can switch the SIP way of investing to mutual fund. As the switching of fund is treated as redeeming the regular fund there is applicable capital gains tax. If you switch the equity fund within one year of investment there will be flat 15% short term capital gain tax and 10% on Long Term capital gain tax for the capital gain gain of over Rs 1 LakhSo, if you have ongoing SIP in an equity fund, stop the SIP for one year and switch the fund after that. The debt fund has both short term and long term capital gain tax. Long term capital gain tax for a debt fund has indexation benefit and thus the effective tax is low. You can wait for 3 years for a debt fund after investing to switch to a direct fund. I have not noticed any of the fund houses charge switching fees. The exit loads are only applicable charges for switching the equity funds. There is no exit load for most of the debt funds. However, some debt funds may have charges to discourage the quick redemption of the fund. Should you invest in direct mutual funds? From the above explanation, I hope you are clear about the edge of direct funds over the regular fund in terms of return. This is good for DIY investors and ace investor who decide the finance by themselves. The beginner or those cannot analyse mutual fund performance by themselves has to rely upon a distributor for the selection of the fund. You can also hire an independent financial planner (fee only) and invest in the fund according to the suggestion.